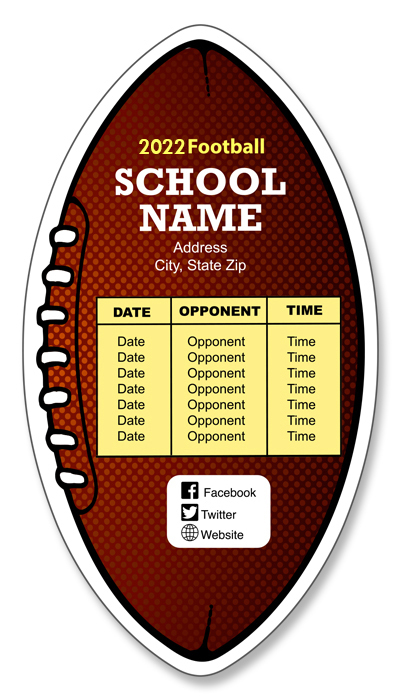 A 3 x5.5 inch football shaped school magnet can be utilized by advertisers to promote a school team. Sponsoring a school team or promoting them liberally is the best way to seek an easy public attention. Teams who are ready to sponsor the school football team can always find success with this magnet. They can offer it as a business token or business gift with some purchases or they can offer it to the schools urging them to distribute it amongst students. The magnet can be easily customized against the payment of $0.26.